Samsung has always put its best foot forward with the Galaxy Note. You get the latest and greatest specs, a massive industry-leading display, and the truly unique S Pen. Battery life is never a concern, nor is any app or software you want to run. You'll pay extra to get the complete package, but it's worth it for many people who just have to have a stylus. The Galaxy S9+ is going to outsell the Note 9, and that comes down to a simple equation: it's nearly identical to the Note, but is considerably less expensive. Its screen and battery are a little smaller, and it lacks the S Pen, but otherwise is identical in daily use. That makes the GS9+ an incredible value for about $640. Samsung phone fans always have something new on the horizon. With both a Galaxy S and Galaxy Note announcement every year, you're never more than six months away from a new high-end phone that showcases the latest and greatest the company has to offer. But that also puts you in a weird position immediately after one of the two phones is is announced: so right now, if you're looking to upgrade, do you buy older Galaxy S9+ at a discount, or the newer Galaxy Note 9? With so much shared in the core platform of the Galaxy S9+ and Note 9, the differences are minimal — but just in case you're looking for the absolute best, the Note 9 has the GS9+ beat in a few areas. 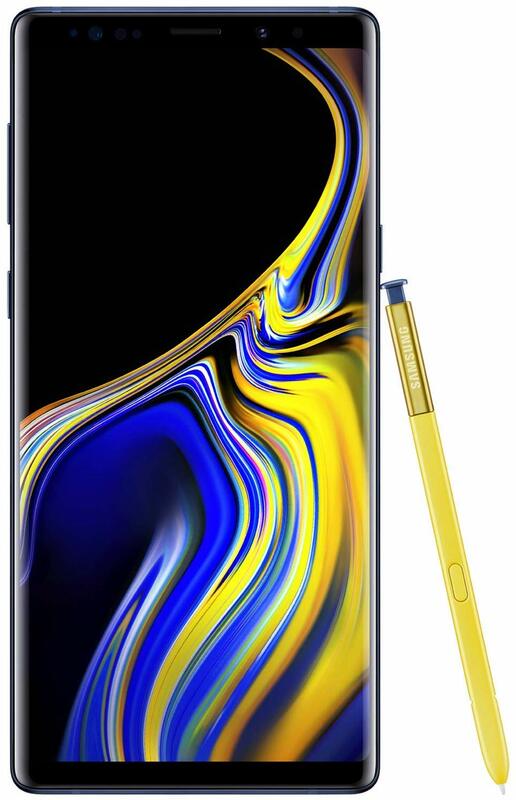 The Note 9 has a jump in battery size, all the way up to 4000mAh, which is 14% more capacity — paired with the same internal specs, that directly translates to 14% longer battery life. The Note 9 also has a trump card with its storage. There's an option to buy 512GB of internal storage, which is double the highest Galaxy S9+ option. When paired with a 512GB microSD card, you'll have over 1TB of storage locally on your phone. Amazing. That storage option also comes with 8GB of RAM, an upgrade over the 6GB in the base model and the Galaxy S9+, but don't be fooled there — very few situations will require that much RAM. Diehard Note fans shouldn't settle for the Galaxy S9+. To wrap it up simply, if you're a diehard Note fan you won't be satisfied with a Galaxy S9+. Yes, the screen is almost as big, but the GS9+ is missing the feature that makes the Note name so important to people: the S Pen. If you've spent your time getting used to the power and precise input of the S Pen on your current Note — perhaps a Note 5 or even Note 8 — it'll feel like a downgrade moving to the Galaxy S9+ even though it's a great phone in itself. There are a few reasons to get the Note 9, as pointed out above, but the big differentiator here is the S Pen — your decision to buy the Note 9 will probably hinge on that point. The Note 9 made a few key advancements in storage, battery size and of course the S Pen — but the rest of the phone is identical to the Galaxy S9+. The processor, base RAM and all of the core hardware features can be found on the Galaxy S9+ — all the way down to the charging rate, buttons, ports, dual speakers, IP68 resistance … and on down the list. The cameras, too, are the same on the Note 9. Don't be fooled by Samsung's new "intelligent" camera features — those are minor changes to the interface and shooting experience, not dramatic improvements to the actual quality of the photos you take. The Galaxy S9+ is just as capable of taking wonderful shots as the Note 9, even without scene detection — and there's a really good chance those features will make their way back to the GS9+ with the next platform update. The Galaxy S9+ does have a smaller display, but it's a negligible difference of just 0.2-inches diagonally — something you really won't notice in regular day-to-day use. The display quality itself is wonderful on both phones, both indoors and out. So when you look at the true game-changing differences between these phones, there are really only three reasons why you wouldn't get the Galaxy S9+: you need an S Pen, need 512GB of internal storage or need that 14% larger battery. If you don't need those features, you'll be far better served by buying a Galaxy S9+ for less money. The Galaxy S9+ currently starts at $640, a full $160 less than the base Galaxy Note 9 — that's a significant price difference that can make you think twice about how badly you need those few extra features. But if you want the biggest and best, and money isn't an issue, the Note 9 is clearly the superior phone overall. The extra money spent isn't wasted. The Note 9 is easily Samsung's best phone, with all of the specs and capabilities you could ever ask for. Its only problem is that the Galaxy S9+ gives you nearly the same experience for over $160 less. Buy the Note 9 if you can't live without an S Pen; everyone else should consider a Galaxy S9+. Before the Note 9 came out, we were in awe with the Galaxy S9+. It's a proper flagship phone, with all of the right specs and features to make just about anyone happy. It doesn't have an S Pen, but then again it's also currently $160 less than the Note 9 — and that makes it the better choice for most people.